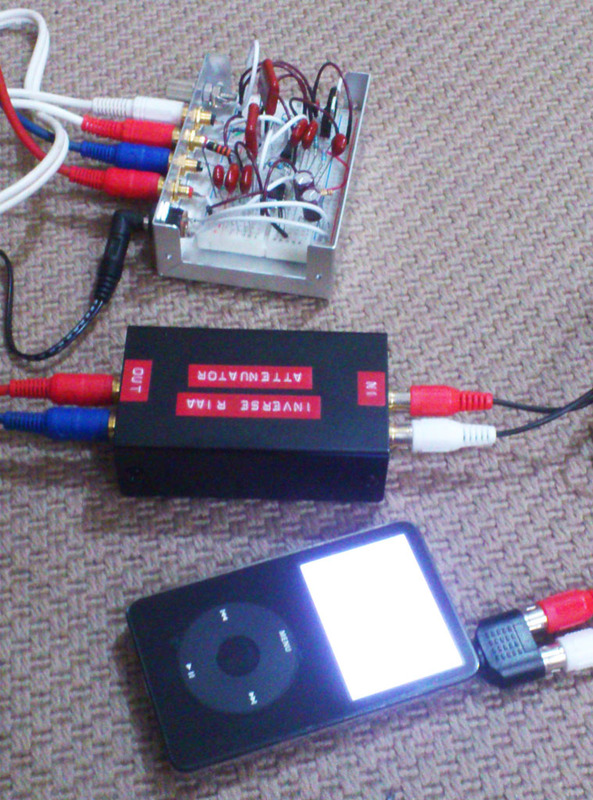 A couple of blog posts ago, we made an RIAA preamplifier (http://diystrat.blogspot.com/2015/03/making-riaaphono-preamp.html). Hopefully you understand what that is now, but if you don’t, maybe have a look at that post now. As part of the process of making that preamp, I found it useful for testing purposes to have an inverse RIAA attenuator on-hand. Wait, a what? 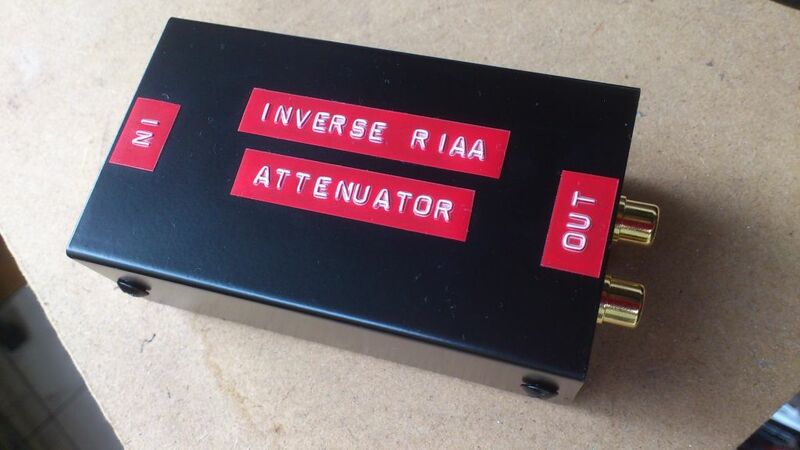 An inverse RIAA attenuator. It's basically the opposite of an RIAA pre-amp. If we refer back to the RIAA Equalization Curve graph that we used on the RIAA preamp post, you'll see that it has two lines (see below). 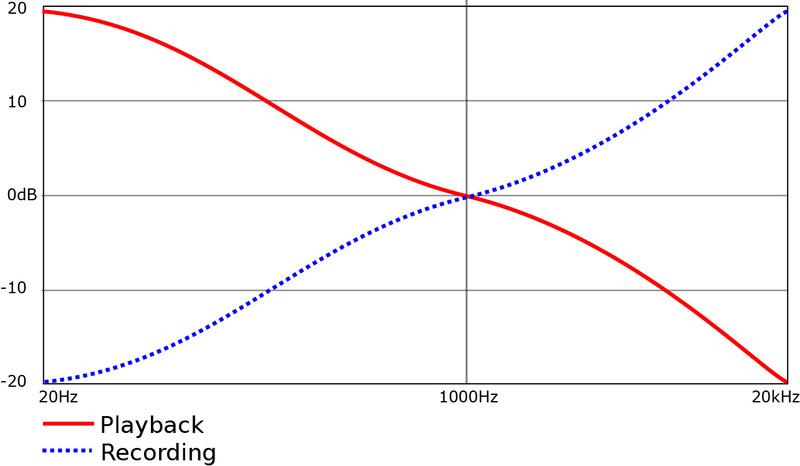 One is called the recording curve (dotted blue line) and one is the playback curve. The RIAA preamp follows the red curve. The Inverse RIAA attenuator follows the dotted blue one. If you were to put one after the other, you would end up with a flat horizontal line running right across the middle of the graph at 0dB. Now I understand that most people would not be in this situation, and therefore this attenuator would seem to be of little use. However, it does have one other fantastic use, and I wish I’d had one when I encountered this exact problem a few years ago. Imagine the situation—you have an amplifier with just a few inputs. One of those inputs is labelled “phono”, but you don’t have a record player, so it’s basically wasted. Well, with a reverse RIAA attenuator, you can plug just about any device with a line-out connection into the phono input using this attenuator as a go-between. In fact you’d probably get away with the headphone output of many devices, though you may have to play with the device’s volume levels to get a decent sound quality/frequency response—in fact I tested this with an iPod and it worked just fine. I highly recommend visiting that site if you want a little more information about the circuit and how it does what it does. 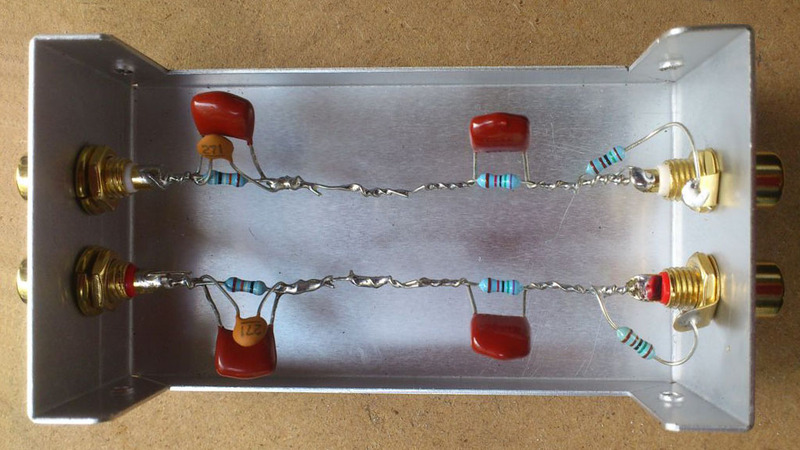 The schematic is extremely simple, requiring only four (or even three--see below) capacitors and three resistors for each channel. So simple in fact, that you don’t require a circuit board. I boxed them in a fairly small project box with a couple of RCA jacks at each end. Then covered it up and marked which end was which (don’t mix this up). This ended up being a simple, cheap and fun project and I ended up with a very handy little device. I built this tonight, and it sounds great! I just need to put in an enclosure (a metal one preferably), do you mind providing the enclosure specs? Thanks for a great little circuit! Dimensions (from memory) were about 8 cm x 5 cm x 2 or 3 cm. What value did you use for R3? I assumed it was 1.5k Ohm for R3 and tried it out. Sorry, man. Crazy days here (I just moved halfway around the world with my family) and I didn't notice your comment till now. I think I also used 1.5k just the same as at the link. I should really have listed that. Apologies. Glad you got it working! What are you using it for anyway? No worries! Thanks again for the post. I installed a bluetooth board into an old 80s boombox and had to attenuate the phono channel because I couldn't figure out how to bypass the phono amp. Plus, I kinda wanted to make the circuit haha! Ha, awesome. Glad the post was useful. BTW, I've updated the post to include R3. I really should've included it the first time. Thanks a lot for the post. This thing is really what i need. However there's one more functionality i need. I need to have a possibility to connect this to a MC input. I think i have to use a voltage divider at the output of this attenuator. But have no idea what resistors values should i use.